There are six state universities, 26 community colleges, and several more technical schools in the state of Kansas, with more than 226,000 students enrolled between them. But the value of college is underrated in parts of the state, despite well-paying jobs that require a college degree, such as nurses and engineers, being highly in-demand. With the expansion of online learning, earning a degree is more accessible and flexible than it used to be; if you want to learn more about how a college degree can increase your career and salary opportunities and how to find the right college for your needs, take a look at our guide to identifying the best online colleges in Kansas below. Located in Baldwin City, Kansas, Baker University is a private, Christian university affiliated with the United Methodist Church. BU offers a variety of both bachelor's and master's degrees that can be earned entirely online, with an emphasis on the fields of business, finance, education and leadership and management. In addition, education professionals can choose from among dozens of online professional development and recertification courses to help meet their continuing education certification requirements. Courses are provided in an asynchronous format, allowing students to access course materials and complete assignments at any time during a course's weekly modules. Established in 2013, Wichita State Online allows students to earn bachelor's and master's degrees and degree completion programs in a wide range of disciplines through distance learning. Of particular note are a number of healthcare-related degree options, including a registered dental hygienist to Bachelor of Science in dental hygiene, Master of Arts in aging studies, and MSN to DSN. Online students pay in-state tuition rates regardless of where they live. Each student is assigned a dedicated Online Success Specialist who acts as the student's first stop in connecting with all support services, including tutoring, money management, Veterans services and more. Through its Global Campus, Kansas State University offers more than 60 degrees and certificates that can be earned fully or partially online in fields ranging from agriculture and the arts and sciences to education and engineering. The field of human ecology is substantially represented with over a dozen undergraduate and graduate online degree options. Additionally, KSU's Global Campus has partnered with the state's network of 19 community colleges to offer 2+2 bachelor's degree completion programs that allow a student to earn an associate degree at his/her local community or technical college and complete a bachelor's degree in 1 of 3 majors (general business, interdisciplinary social science, or technology management) entirely through distance learning. Pittsburgh State University offers an impressive number of online degree and certificate options, with particular emphasis on master's degrees in the fields of business, education and technology. Programs of particular note include a Master of Science in technology with an emphasis in automobile techology, a Master in Business Administration - International Business, and Ed.S in advanced studies in leadership with 2 emphasis options (general school administration and special education). All non-resident, part-time PSU online students pay the same in-state tuition rates as their Kansas resident counterparts. Fort Hays State University, the third-largest school in the Kansas public university system, is home to a substantial distance learning program known as the Virtual College. FHSU currently offers a large variety of associate, bachelor's and master's degrees in subjects that include accounting, business, computer science, criminal justice, education, information networking and telecommunications and many more. Additionally, FHSU offers 2 Ed.S degrees and a Doctorate of Nursing Practice that can be completed through online study. FHSU's online tuition prices rank among the lowest in the nation. Barclay College is a private, four-year, Christian institution whose mission is to prepare students in a bible-centered environment that results in effective Christian life, service and leadership. Barclay offers 4 bachelor's degrees (Biblical Studies, Business Management, Christian Leadership and Psychology) through its online degree-completion program. A general studies associate degree and 5 undergraduate certificates are also available. Students are required to earn a minimum of 40 college credit hours prior to beginning an online degree program at Barclay. Students with less than 40 credit hours can earn the needed credits by enrolling in the college's online AA degree program. Additionally, master's degrees in 7 Christian-related concentrations can be completed through distance learning. The University of Kansas is the largest public university in Kansas and the flagship school of the state's public university system. KU Online is currently home to a substantial number of bachelor's, master's and doctorate degree programs, as well as several undergraduate certificate programs. Degrees can be earned either fully or partially online depending on the specific degree. Areas of study include business, health care, education, engineering, journalism, nursing, social work and many more. Of particular note is KU's fully online RN to BSN degree program, which can be completed in as little as 1 year. Newman University, a private, Catholic university based in Wichita, Kansas, offers 5 online degree programs, including a Bachelor of Arts in business studies, a Master of Arts in theology, a Master of Theological Studies, a Master of Education and a Master of Business Administration. Students interested in NU's BA in business studies who are returning to complete their degree after being out of school for four years or longer may be eligible for a reduced tuition rate or community college transfer scholarship through the university's Adult Re-Entry program. MidAmerica Nazarene University is a private, Christian, liberal arts college located in Olathe, Kansas. MNU offers 11 online degrees and certificate options, including 6 master's degrees, 3 certificate programs, a Bachelor of Business Administration degree, and an accelerated Associate of Arts degree. Of particular note is the university's MSN/MBA, a dual-degree program designed for licensed nurses with BSN degrees who want to earn both the MS in nursing and an MBA. The program combines online coursework presented in an asynchronous format with attendance at a once-per-week online or on-campus class. Washburn University offers 3 bachelor's degrees (health services administration, medical imaging, and clinical laboratory science) and four professional certificates (diagnostic medical sonography, magnetic resonance imaging, health information technology, and radiation therapy) that can be earned online through its School of Applied Sciences-Allied Health Department. All programs combine online coursework with a required clinical component. For example, the clinical component for both the bachelor's and certificate diagnostic medical sonography programs requires 24 hours per week in clinical participation by the student at a program-approved clinical site for the entirety of the program. Approved clinical sites are available throughout the U.S. and Canada, and a few are available worldwide. How can I find which online colleges offer the degree I'm looking for in Kansas? The best way to discover which college offers your degree of choice is to connect with schools directly. The Kansas Board of Regents offers a list of all of the state's public institutions and an interactive map of Kansas. The state university data book that provides details about each of Kansas's six state universities. Many schools list available online degrees on their website. For instance, Wichita State University provides a directory of their online associate, bachelor's, master's and doctoral degrees. Which online schools in Kansas will accept my transfer credits or work/life experience? Most online colleges in Kansas accept transfer credits from other accredited schools. Public colleges maintain articulation agreements with community colleges, allowing students to easily transfer their associate degrees to four-year schools, and the University of Kansas CredTran system allows you to search for the courses you’ve taken at other institutions to see how they’ve transferred over for other students in the past. Students at the University of Kansas can receive four credit hours in exercise sciences, sport, and health for completing basic military training. Credits for prior knowledge are assessed based on a variety of exams at the University of Wichita, including their Life Experience Evaluation, College Level Exam Program (CLEP) and DANTES military service assessment. How Much More Do College Grads in Kansas Make? Students repeatedly hear that they must earn a college degree to earn higher salaries over the course of their careers. While it’s not true for every job in every industry, in Kansas there’s a clear distinction in pay for jobs that require a college degree over those that don’t. On average, Kansas careers that require a bachelor's degree pay $30,000 more per year than positions that require just a high school diploma. As education-level requirements increase, so does average pay in Kansas, across the board. State economic reports show the fastest-growing jobs in Kansas are in data communications and computer network systems. Other rapidly growing jobs include personal financial advisers, home health aides, enrichment education teachers and computer software engineers—all of which hold additional education as a minimum requirement. Accreditation is an important quality assurance mechanism in the age of online college scams. Students should always attend a regionally accredited college, since these schools are closely monitored to meet the highest standards of academic excellence and offer the best academic programs. Students who do not attend regionally accredited schools may not qualify for federal financial aid or receive employment after graduation. The Higher Learning Commission grants regional accreditation to colleges in Kansas that meet all of the commission's standards. Here’s more on how accreditation impacts online colleges in the state. In Kansas, students should look for schools accredited by the HLC, which regulates colleges and universities online and on-campus programs and services in more than a dozen midwestern states, including Missouri, Oklahoma, Colorado and Nebraska. 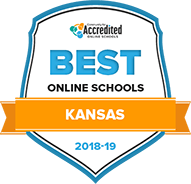 In addition to regional accreditation, top online schools in Kansas may have subject-specific accreditation in certain fields. For instance, Newman University's education program holds accreditation from the National Council for Accreditation of Teacher Education. This ensures both educational and industry standards are being met for new students training to enter specialized fields. Paying for college is one of the leading factors determining college choice. In Kansas there are many financial aid and tuition break programs to take advantage of, you just need to know where to look. Out-of-state students attending Kansas universities online might be able to receive reduced tuition through the Midwest Student Exchange Program. As part of this reciprocity agreement, students can avoid paying out-of-state tuition if they reside in neighboring states like Indiana, Ohio, or Michigan. Local students can check their county of residency for deals on college tuition, such as at the University of Kansas City, where a Kansas rate is offered despite the school’s location on the border of Missouri. Military status could mean a discounted tuition rate beyond the GI Bill and other federal education benefits that students in the service receive, like Ottawa University’s dedicated Military Tuition Rate. These are just a few answers to the financial questions on the minds of Kansas students—take a look below for more information on funding your online degree. What are Kansas's requirements to qualify for in-state university tuition? You can qualify for in-state tuition if you live in Kansas and remain financially independent for at least one year before classes begin. In addition, you must show your intent to permanently reside in Kansas. You should provide proof that you work full time in the state, have registered to vote in Kansas, or possess a state driver's license. Furthermore, you must have moved to Kansas for some purpose other than in-state tuition, ane may take no more than three credit hours per semester during the year leading up to the session for which you request residency. Are online credits more affordable in Kansas than other places? Public college tuition in Kansas costs $9,200 for in-state students. This number falls slightly below the national average of $9,400. However, specific costs vary from school to school. For instance, Fort Hays State University charges just $5,000, while Kansas Wesleyan University costs nearly $29,000. While that seems like a large difference, it doesn’t take financial aid into account—Kansas Wesleyan University offers financial aid to 99 percent of new students. How can I get help paying for online college in Kansas? Besides taking advantage of federal college aid and filling out the FAFSA, you can find a wide variety of scholarship and grants to help fund your education. Below are a handful of funding opportunities available to college-bound students who study online in Kansas. Kansas Ethnic Minority Scholarship: This scholarship assists minority students who demonstrate financial need. Students must also have a history of academic excellence. Kansas State Scholarship: Kansas students who finish high school in the top 20 percent-30 percent of their class qualify for this scholarship. Kansas Comprehensive Grant: This scholarship benefits Kansas students who decide to study full time at an approved private or public college in the state. The grant awards $200-$3,500. Between July 2016 and June 2017, more than 7,000 people across Kansas participated in adult education programs. These include college preparation and basic education courses for adults who have been out of the classroom and need to brush up on their skills before feeling comfortable enrolling in an online degree program. In Kansas, adult education programs serve mostly students between the ages of 25 and 44. Dual credits towards a college degree – Provides dual enrollment opportunities for Kansas students to earn credit for their degree programs while completing adult education courses. GED / High School Equivalency preparation and testing – For adults who have not received their high school diploma, completing Kansas’ GED can be the first step towards a college degree. Language courses for English learners – English language and literacy classes help prepare students learning the English language to take college-level courses. A complete list of adult education centers in Kansas is available from the Kansas Board of Regents. In 2017, nearly 20,000 people across Kansas participated in adult education programs.